Excellent 2018-02-22 18 Trails have been tilled and groomed iide, they are flat, fast and fun with a granular surface doe to the tilling. Groomed from Skate skiing and classic, great skiing today, we have plenty of snow, i wrote the word powder into the snow today in the picture before heading out. Excellent 2018-02-15 17 Trails are groomed wide for skate skiing and track is set for classic, trails are in excellent condition. Highly recommend a ski if you have time over 17 km groomed, interesting terrain, lots of views, hills and well worth the visit. Excellent 2016-01-16 10 Groomed trail underneath with soft granular snow coming in on top as it is snowing today, smooth, beautiful skiing - classic may be best today, no track laid. Good 2015-01-03 I skied about 4-5 miles believe there is about 8 miles groomed total. Good coverage - groomed last night Jan 2nd. Wide grooming - for skate skiing. Skied up to Hammond Ridge, new trail opened just this year. Track set in places. Excellent 2014-04-04 4/3 There is 2.5 ft of snow on the ground and NEOC is going to groom as temperatures permit into the middle of the month...Skied today - excellent, got out when temp were in the mid 30s. Great Ski. Excellent 2014-03-14 All the snow NEOC got is making for the most fun this year. I skied yesterday at 3pm and they were just heading out to groom again when I finished. The snow was soft, fast and fun. Today may even be a "call in sick day!" 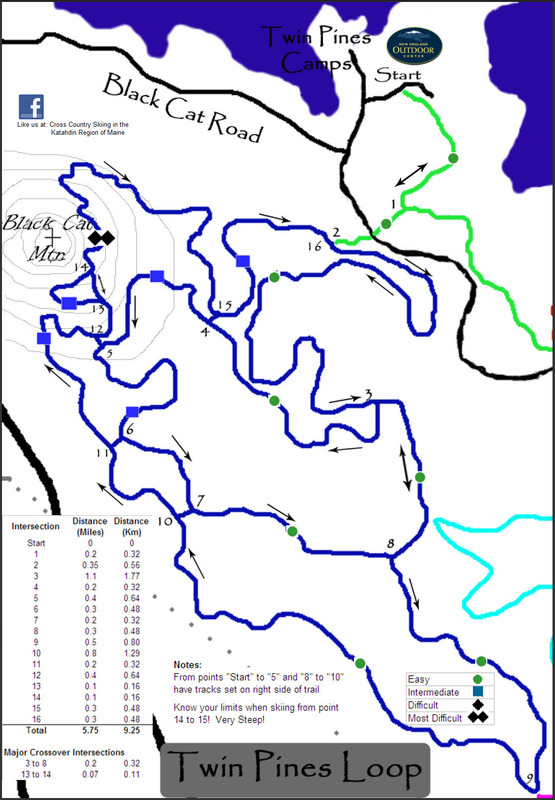 Trails are graded in the traditional - green, blue and black - for easy, moderate and difficult. Going to head out there again today. Excellent 2012-03-02 10 We are grooming and setting Track today. Snow and conditions are excellent. Groomed Grant Brook this am as well, call Twin Pines for access info. Trails are open to the public at no charge! Excellent 2012-03-02 8 Groomed the Grant Brook Trail this morning. This trial can be accessed from just above the parking lot by the North Woods Trading Post and follows the shore of Millinocket Lake and enters the Grant Brook wetland. It is an ideal, groomed but not track set back country ski.